Stars After Stars After Stars-which borrows its name from the legendary "J and H Productions" underground tape-finds Priggen tackling an assortment of tunes originally recorded by the likes of the Ramones, Big Star, Alice Cooper and the Zombies, as well as such lesser-known but no less notable acts as the Pontiac Brothers, the Jacobites and Hot Bodies, local legends from Priggen's hometown of New Haven, Connecticut. Although written by others, the artist imbues the songs with the same sonic adventurousness and emotional commitment that he applies to his own compositions. The self-produced album was recorded with an array of vintage gear and a musical cast that includes Cheap Trick drummer Bun E Carlos, a longtime Priggen pal who plays on six of the album's songs and whose last non-Cheap Trick studio credit was with John Lennon. Stars After Stars After Stars also features a virtual Who's Who of the NYC music scene, including guitarists Ivan Julian (Voidoids/Matthew Sweet), Mark Spencer (Blood Oranges/Jay Farrar), Jon Graboff (Beat Rodeo/Laura Cantrell), bassists Danny Weinkauf (They Might Be Giants/Fountains of Wayne) and Scott Yoder (Kevin Salem/Amy Rigby), drummer Brian Doherty (They Might Be Giants/XTC), keyboardist C.P. Roth (Blessid Union of Souls) and mixer/engineer Adam Lasus (Clem Snide/Helium). Listen To "Stars After Stars After Stars"
My new record "Stars After Stars After Stars" in RealPlayer format. 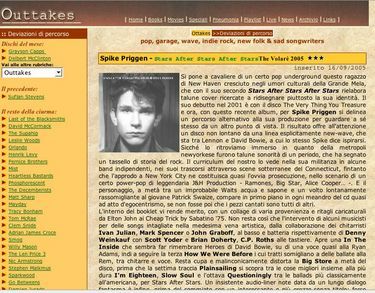 Si pone a cavaliere di un certo pop underground questo ragazzo di New Haven cresciuto negli umori culturali della Grande Mela, che con il suo secondo Stars After Stars After Stars rielabora talune cover ricercate a ridisegnare piuttosto la sua identità. 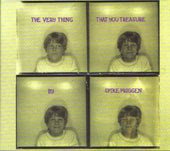 Il suo debutto nel 2001 è con il disco The Very Thing You Treasure e ora, con questo recente album, per Spike Priggen si delinea un percorso alternativo alla sua produzione per guardare a sé stesso da un altro punto di vista. Il risultato offre all'attenzione un disco non lontano da una linea esplicitamente new-wave, che sta tra Lennon e David Bowie, a cui lo stesso Spike dice ispirarsi. Sicché lo ritroviamo immerso in quanto della metropoli newyorkese furono talune sonorità di un periodo, che ha segnato un tassello di storia del rock. Il curriculum del nostro lo vede nella sua militanza in alcune band indipendenti, nei suoi trascorsi attraverso scene sotterranee del Connecticut, fintanto che l'approdo a New York City ne costituisca quasi l'ovvia prosecuzione, nello scenario di un certo power-pop di leggendaria J&H Production - Ramones, Big Star, Alice Cooper… -. E il personaggio, a metà tra un improbabile Waits acqua e sapone e un volto lontanamente rassomigliante al giovane Patrick Swaize, compare in primo piano in ogni meandro del cd quasi ad atto d'egocentrismo, se non fosse poi che i pezzi cantati sono tutti di altri. A covers album can be a risky proposition, but Spike Priggen has chosen his material with care and reworked it with style and panache. There are good versions of obscure tunes such as 'Be Married Song' by Ward Dotson, Spike's old buddy from his Liquor Giants days, and a Jacobites tune, 'Only Children Sleeping'. On both songs a lap steel is used to great effect and without any overtones of country. On tunes by slightly more well known artists, Spike and his band give the songs reverential and melodic makeovers. The original artists would barely recognise 'Questioningly' (The Ramones) or 'I'm 18' (Alice Cooper) but I am sure they would be pleased with the new versions. 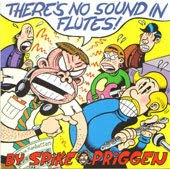 Spike has a good voice that sometimes has the breathy quality of Freedy Johnston, another power pop veteran who has yet to receive the success he deserves. At other times he reminds me of Michael Stipe; in other words the guy can really sing. 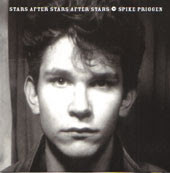 After years playing as a sideman in classy US indie guitar bands like The Liquor Giants and Dumptruck, Spike's released his first album in 2001. The self-penned tunes received such critical acclaim that I'd like to track down a copy, as his approach to covers shows style and flair.